Deep below the ground in the Jhelum district of Punjab, Pakistan lies the Khewra Salt Mines – the world’s oldest and second largest in operation (the Sifto Mine in Ontario, Canada is the largest). 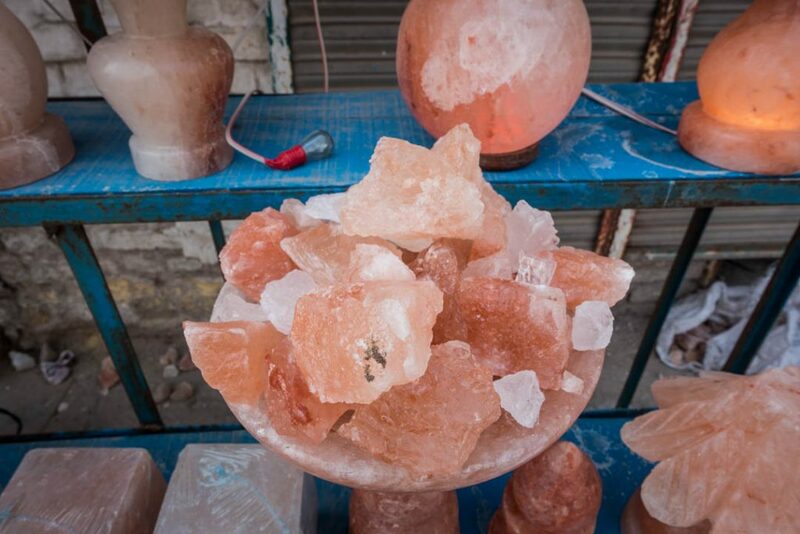 Producing more than 350,000 tons of salt per year to this day, it is Pakistan’s main source of halite – also known as “Himalayan Pink Salt”. 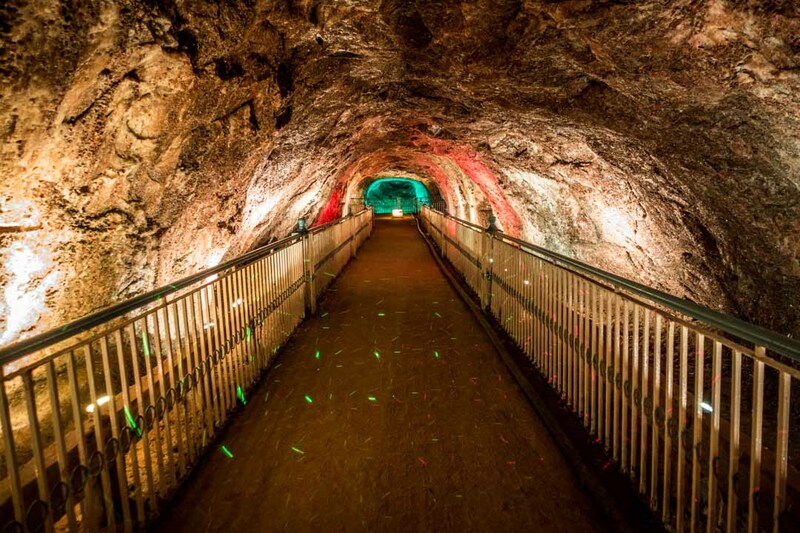 Despite the area being a currently active mine, it is also a tourist attraction that receives more than 250,000 visitors per year and provides tours on a daily basis. 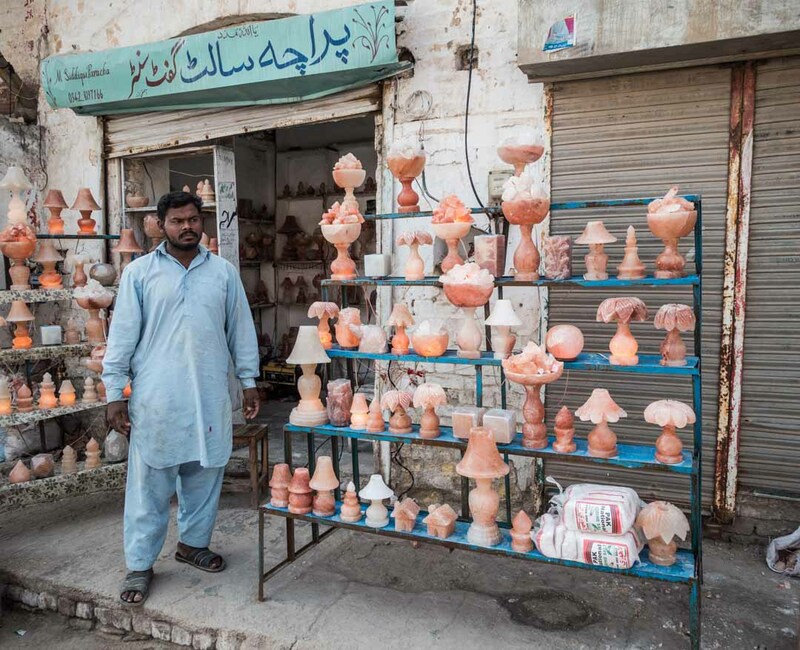 I recently took a tour of this geographic marvel and gained a deeper understanding of the essential role that salt mining has played in the economy and history of Pakistan. Salt in this region was first discovered by horses of Alexander the Great, who were licking it from stones during the leader’s battle with Raja Porus of India. However it wasn’t until much later that King Akbar, who reigned from 1556 until his death in 1605, began to mine the area and use the salt as sources of both nutrition and revenue. 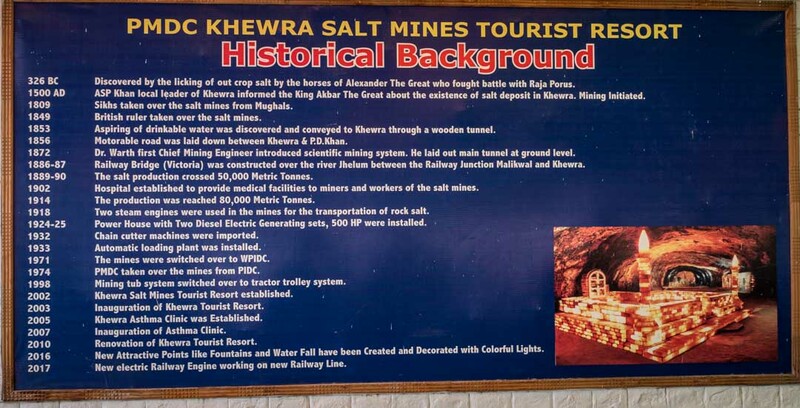 In the mid 1800s, British forces took over control of the Khewra mines and began further developments to increase its safety and productivity such as widening tunnels, constructing warehouses, and introducing an improved excavation mechanism. In the 1900s, steam engine systems were installed which further enhanced capabilities and production. Upon Pakistan’s independence in 1947, the mines were handed over to the newly-formed government. Today, the mine consists of twelve levels (seven above ground and twelve below) at a depth of 748 feet and containing 25 miles of tunnels. Although the mine is part of a much larger network of salt deposits all across the continent, only about half of the product is mined while the rest is kept in place to act as a support system to protect from the tunnels caving in on themselves. The mines are currently owned and operated by the Pakistan Mineral Development Corporation. Riding the railway down into the belly of the mine. Located approximately 100 miles from Islamabad, the journey takes three hours from the capital city. From Lahore, the trip takes approximately 3.5 hours along the M-2 Motorway. Google Maps shows the location here. There is plenty of free parking available at the site. 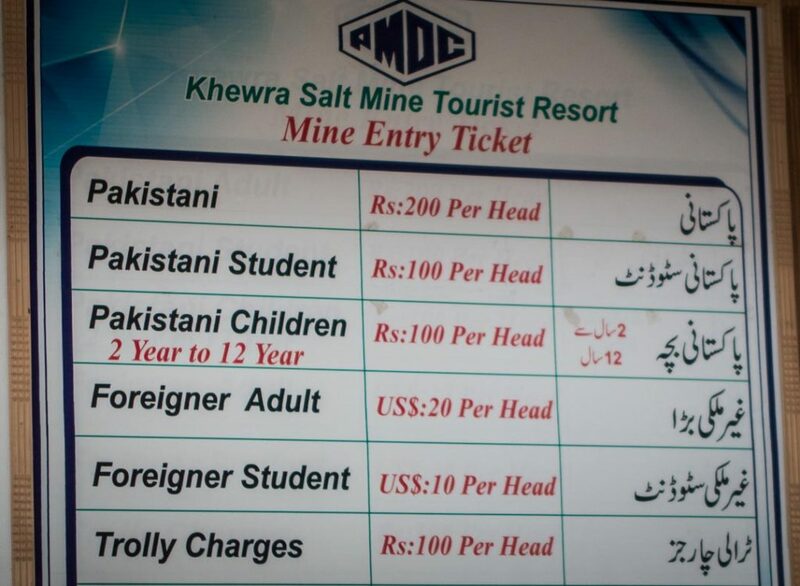 Ticket prices for entrance into the Khewra Salt Mine. Much like other government-owned attractions (the Pyramids in Egypt, for example), the ticket prices for locals and foreigners differ immensely. The price for an adult foreigner in 2018 is USD $20 whereas the cost for a Pakistani adult is 200 Rupees ($1.50). 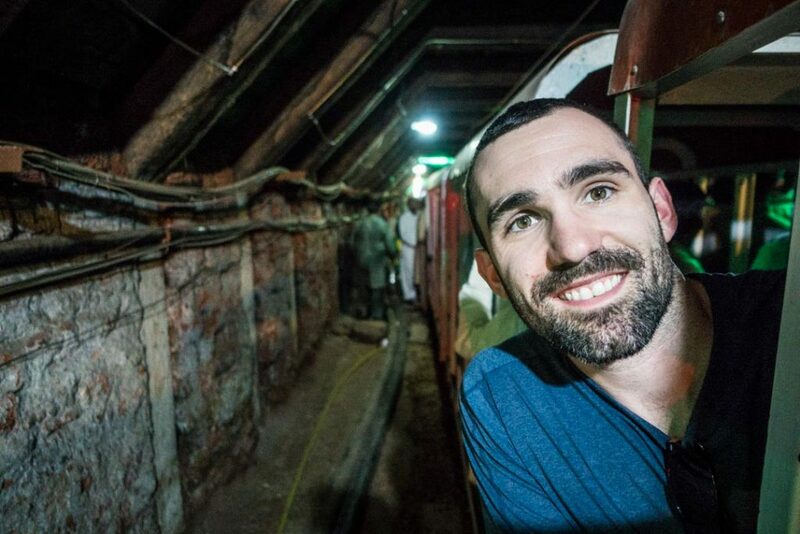 After paying the fee and walking a short distance to the mine entrance, you climb aboard a small train (you may also walk, but it’s a tight squeeze) and are transported to one of the many underground levels. Once disembarked from the train, you begin the tour and are exposed to a number of unique features and artifacts. 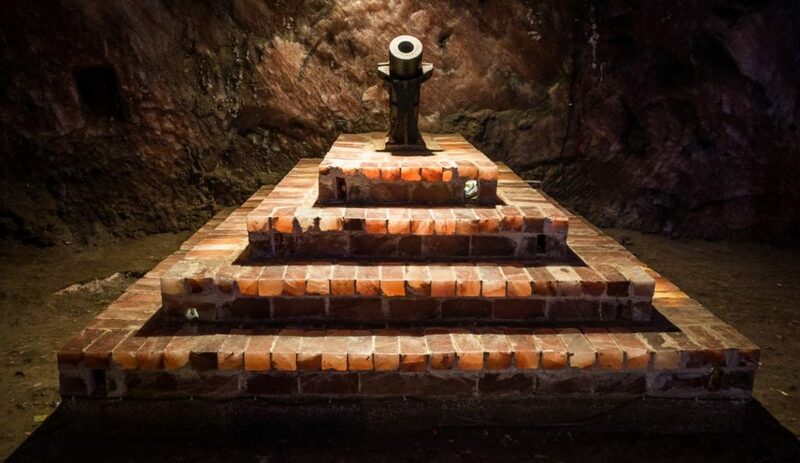 In the late 19th century, while the British were developing the mine further, cannons such as this one were used to blast the ceiling and shake free large chunks of salt. The workers would use these to quickly mine a difficult-to-reach area before advanced machinery was introduced. Luckily, it isn’t currently active. The Minar-e-Pakistan is a well-known monument in Lahore which was completed in 1968 to commemorate the passing of legislation which began the process for Pakistan’s independence from India in 1947. 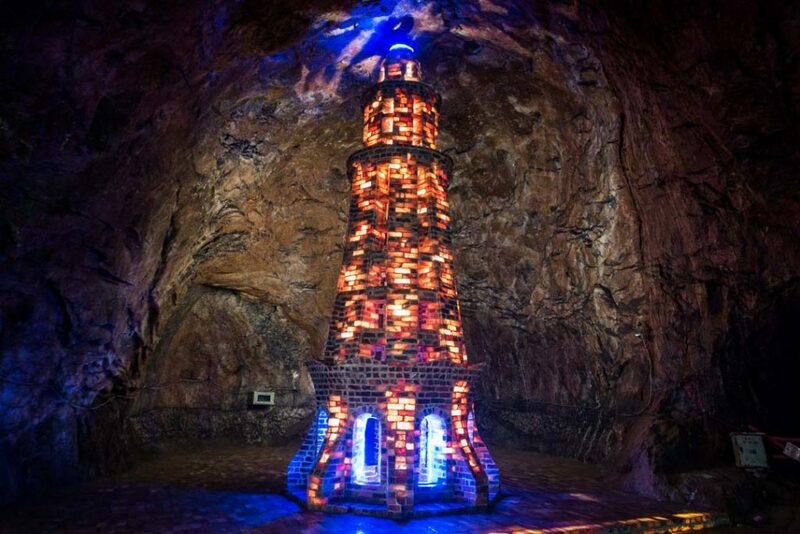 In the Khewra mine, this monument has been replicated with rock salt and beautifully illuminated. Because there are different types of salt in the Khewra mine, the colors show up lighter or darker depending on the amount of iron a particular piece contains (more iron = darker, redder color). 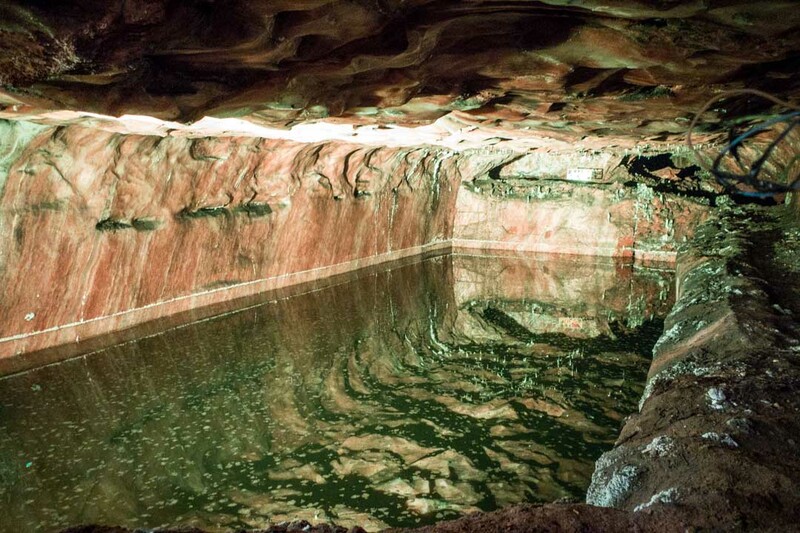 Throughout the tour, you will pass by a number of these brine pools. These areas were mined during the Mughal era (1500s) and contain an extremely high percentage of salt concentration – more so, even, than the Dead Sea in Jordan and Israel. Because the water is so dense, the ceiling’s reflection is strong and sharp. Most of the pools are difficult to see as it is quite dark, but they have been illuminated with various lights to show how far, deep, and spectacular each one is. Stalactites and stalagmites are formed when heavily-salted water drips from the ceiling and evaporates, leaving behind just the salt which then dries to be rock-hard. These features line the entire mine in various forms from barely noticeable to massive behemoths like the one above. Just outside the entrance to the Resort is a street lined with shops selling artifacts carved from locally-mined salt. Lamps, ashtrays, letters, and raw salt for consumption can all be purchased at very reasonable rate from any of the fine vendors hawking their wares. For the best price, avoid purchasing from the vendors located inside the mine and instead wait to stop at one of these shops on your way out. 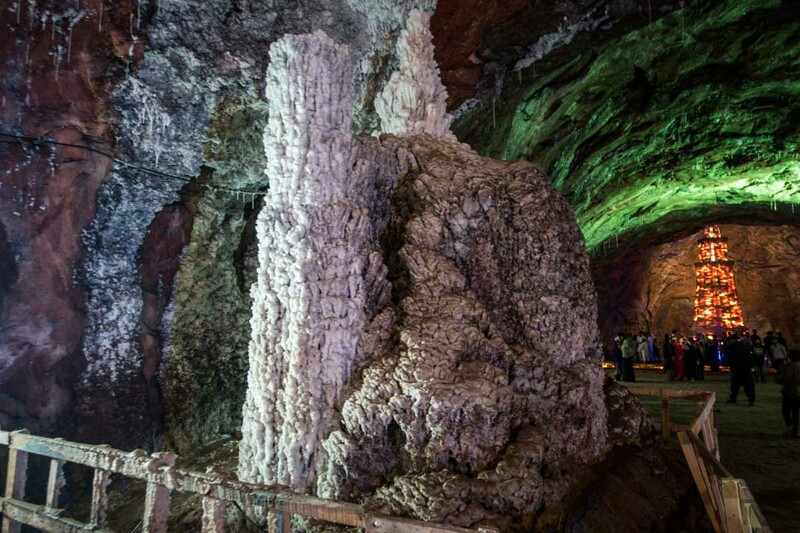 If you’ve never visited a salt mine, it’s a unique experience. I recently read the book Salt: A World History by Mark Kurlansky and it explained all about why salt is such an important element. Wars have literally been fought over salt and it used to be far more valuable than gold, if you can believe it. 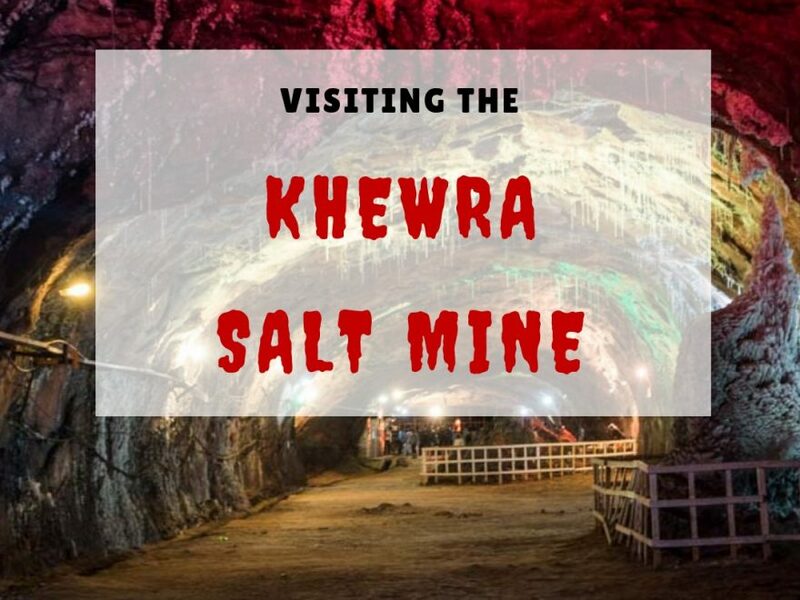 The Khewra mine is the world’s oldest and second largest operational salt mine in the world. With easy access from both Islamabad and Lahore, it’s a great way to learn more about the history and importance of mining in Pakistan.